It’s not because I am obsessed with cows or chocolate or cheese, although I am fond of all three. Pocketknives, wristwatches and beautiful landscapes intrigue me, but it wasn’t any of those interests that brought me to Switzerland this year. No, it was a theologian: namely, John Calvin, who is garnering renewed worldwide attention this year, the 500th anniversary of his birth. In his honor, the University of Geneva invited hundreds of the world’s premier scholars to share their knowledge at a conference titled “Calvin and His Influence.” This group of scholars is the deepest well of knowledge pertaining to Calvin’s life and influence to be assembled in the same place at the same time in 500 years. I traveled to Geneva, not as one of the elite scholars, but as a novice with a recently acquired taste for Reformed theology and a desire to get in touch with the roots of my faith. I cannot fully express the excitement I felt as I stepped off the train platform to enter the bustling city of Geneva. Not only is it the hub of the international world, hosting over 500 organizations including the WHO and Red Cross, but it is also where Calvin lived and worked for most of his adult life. When I entered the conference center, just steps away from the UN, I gazed at the large auditorium and listened to the low hum of international conversation. Every seat was outfitted with headphones for simultaneous translations into several languages and a microphone for addressing comments to the speaker. My excitement turned to giddy anticipation, and I had to stop for a moment to take it all in. The lectures themselves were riveting, and at times quite overwhelming. I took notes vigorously as scholars from Oxford, Harvard and the universities of Paris, Geneva and South Africa took to the microphone to present papers on the life and influence of Calvin. The experience was quite like “trying to take a drink from a fire hydrant.” I never realized how extensive of an influence Calvin has had over the years. I could not begin to describe the extent of his influence in this short testimony, but perhaps I can illustrate it with two examples from places I visited in Geneva: The Cathedrale St. Pierre, and the Academy. The Cathedrale is an enormous Gothic church whose stones the great reformer’s voice echoed among for his 25 years as Geneva’s pastor. I sat silently in this church for about an hour, praying, gazing upwards towards the vaulted ceilings, exploring the side chapels and stained glass, and listening to the tapping of footsteps and the creaks of wooden pews as they greeted and bade farewell to the tourists who sat in them. This church took on special meaning to me during the conference because I learned during a lecture that by the time Calvin took the pulpit of Cathedrale St. Pierre in 1536, the initial spark of the Reformation was dwindling due to divisions within the Reformed community. 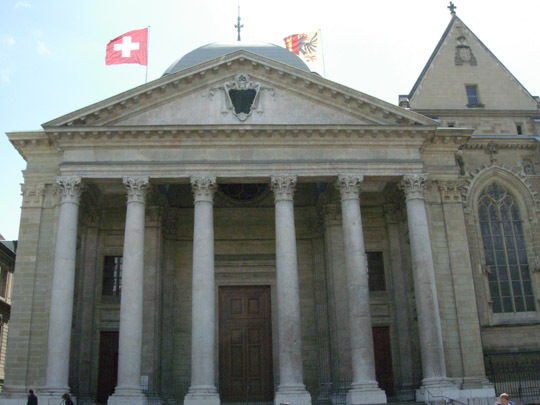 Calvin’s pastorate in Geneva fanned the diminishing flame of the Reformation. Protestants everywhere in the world are somehow connected to this church, for it gave Calvin the platform from which he exerted pastoral influence to Geneva, and Geneva served as a bastion in which the newly fortified Reformed faith built strength and ultimately spread throughout Europe and the world. The momentum of the Reformed faith became even more powerful through the establishment of a College and Academy in Geneva. Just a few alleys away from the Cathedrale stands an unassuming wooden structure built 450 years ago under Calvin’s directive. At the time, the mission of this Academy was revolutionary: to train and send pastors throughout Europe. No one knew at the time how significant this Academy would be in the course of world history. As I learned at the conference, some of the new proselytes of pastors from this Academy became weary from oppression and decided to leave their homes in search of religious freedom. They went to North America and became the first colonists of America. Colonial America was not just a Protestant Christian nation, but a Reformed Christian nation, settled by the Puritans, the Dutch Reformed, and the Huguenots. American history books often tell the story of the Mayflower without tracing the story to its true beginnings: Calvin’s Academy in Geneva. My trip was a quick four days, just long enough to attend the three-day conference and visit a few important sites. I saw the magnificent Red Cross museum, and was also able to sample the international cuisine (including a vegetarian McDonald’s item, the best Mexican food I’ve ever had, and of course some local favorites like crepes and croissants). While I enjoyed the rich international history and cuisines tremendously, at the heart of my pilgrimage was the desire to get in touch with the roots of my faith. Through the wonderful lectures at the conference and the historical sites I visited while in Geneva, my mission was accomplished. Michael Moradshahi is finishing his M.A. in Theology from Talbot School of Theology and is currently working on his Ph.D. in Clinical Psychology from Rosemead School of Psychology.